Middle@: [Peninsula-Patriots] FW: Photos everyone must see!! [Peninsula-Patriots] FW: Photos everyone must see!! Please pray for our nation. We may not see all of this but, our children and grandchildren will. WANT TO SEE WHERE OBAMA IS TAKING US? 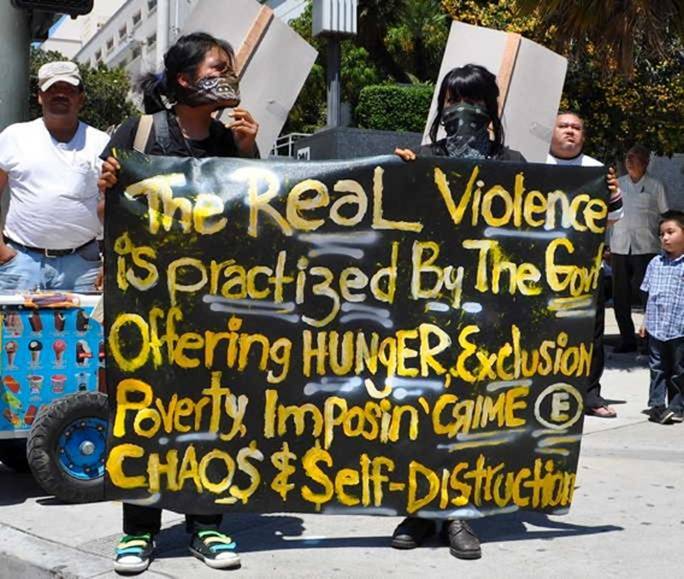 THIS IS HAPPENING IN AMERICA AS YOU READ THIS. WAKE UP AMERICA , THIS MUST BE STOPPED. This is absolutely unbelievable! 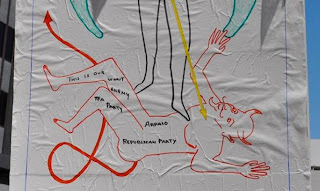 God bless America , we have lost our way. It needs to go viral so that Americans can see what is happening in this country. A May Day rally in Los Angeles, co-sponsored by the SEIU and various communist groups, as well as other unions, reflected yet another step in the normalization of self-identified communist and socialist ideologies in the Obama era. 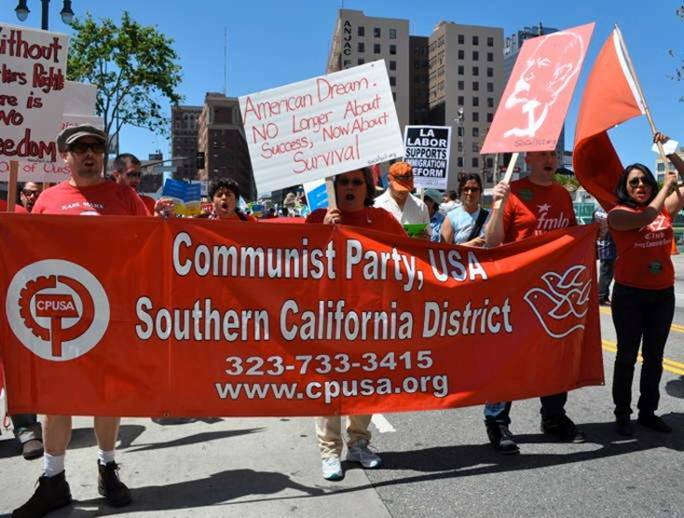 Not only did the SEIU help to organize the rally in conjunction with communists, they marched side-by-side with communists, while union members carried communist flags, communists carried union signs, and altogether there was no real way to tell the two apart. 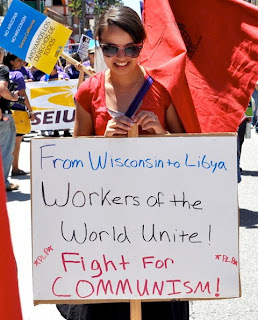 The communists freely and proudly declare their affiliation. 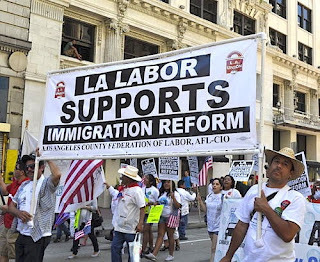 And the SEIU has no problem marching arm-in-arm with them. "the organization that spent the most to help Barack Obama get elected president." Furthermore, who is Obama's favorite White House guest and one of his closest confidants? 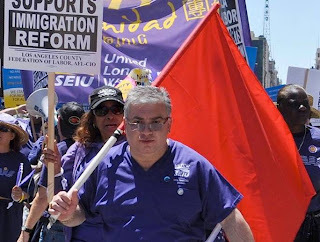 The individual who has visited the Obama White House the most: SEIU President Andy Stern, who has visited 53 times. 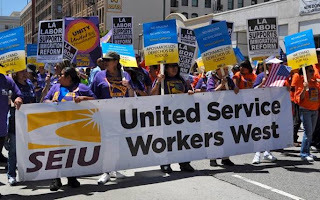 Obama is closely linked with the SEIU. 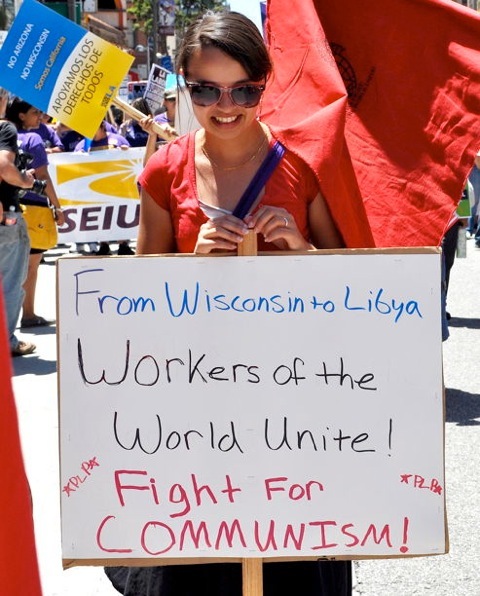 The SEIU is closely linked with communists. Did I say communists? 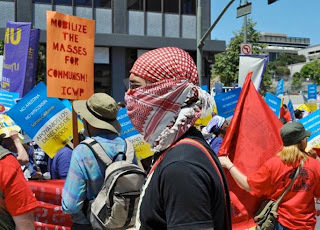 Sorry, I meant Communists (with a capital "C"). 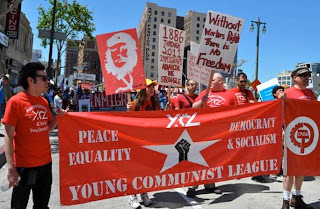 Note how the Communists that day (like the women on the right in this photo) carried solid red flags symbolizing their ideology. Keep that in mind as you view the next photo. One of the SEIU leaders picked up a Communist flag and led a contingent of rank-and-file SEIU members. Everyone was OK with that. 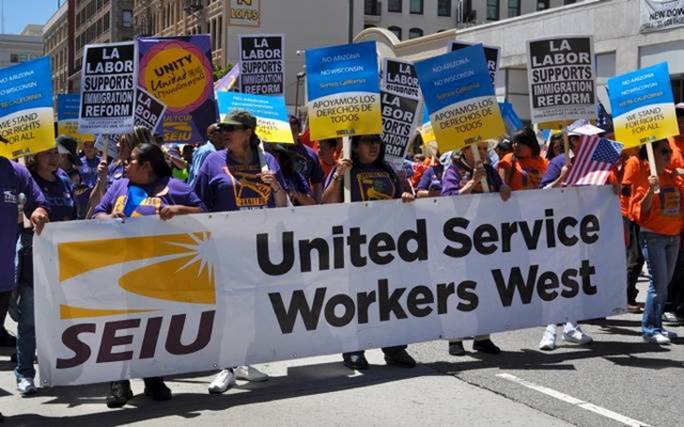 The way you can identify the SEIU members in all these pictures: They're the ones in purple t-shirts carrying blue-and-yellow signs. 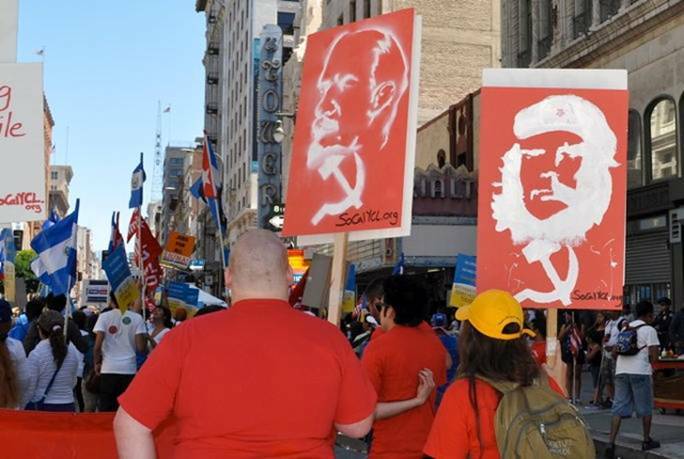 So, as you can see, the communists and the union members intermingled as the march progressed. In case you were wondering what the SEIU was saying during all of this, here's a video of the SEIU chanting "Legalization or REVOLUTION!" Clear enough? 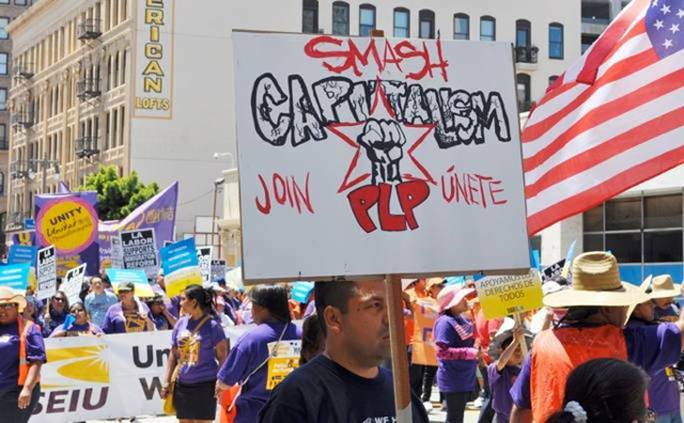 And it wasn't just the SEIU at the march - other "normal" unions like the AFL-CIO were on hand as well. There were plenty of teachers' unions attending too, and they brought along many of their public school students for some good old-fashioned communist indoctrination. Ever lived. Right up there with Lenin, apparently. 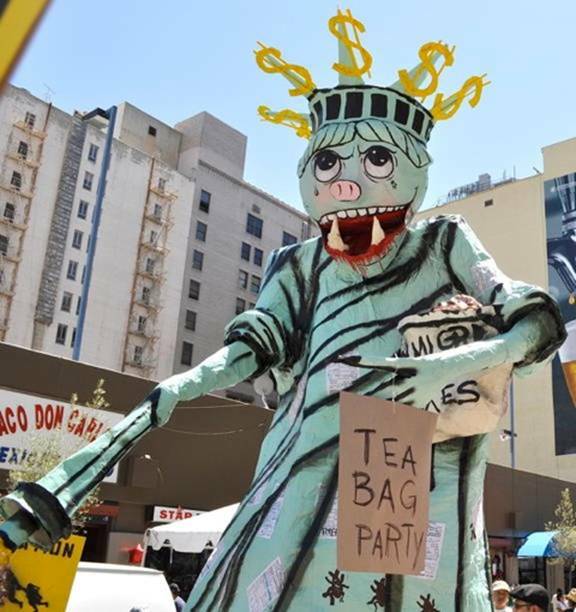 In order to have a more "civil dialogue" with their political opponents, the marchers made a puppet of a demonic Statue of Liberty aligned with the "Tea Bag Party." OK, I guess Hitler comparisons are off the table for now - too many people have called it taboo. So what's second best? The Devil! Tell me the honest truth: If the Tea Party had marched in a rally behind a banner held up by fascists or neo-Nazis, don't you think it would have been national news? 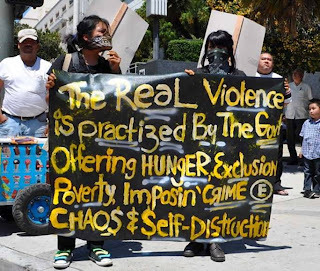 But the nation's biggest Obama-supporting political organization marched behind banners like these, and not a peep about it in the media. Hmmmm..
Until recently, the average American has regarded fascists and communists as equally noxious and equally malignant. As well they should have. But the drive these days by the left side of the spectrum is to make communism and socialism somewhat less remarkable and more palatable. 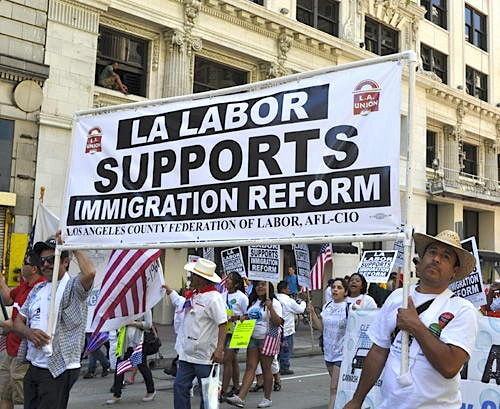 For two years they angrily denied the Tea Party accusation that Obama's policies and supporters had a socialist bent. But in recent months, as the accusation had started to gain traction, the new leftist tactic has become: "What's so bad about socialism after all? You're demonizing a very popular and respectable ideology!"